In this article the author provides literature review regarding sector rotation investment strategy. Russia has a young stock market and hence there is not enough theoretical or empirical research regarding sector rotation. This paper can be beneficial for Russian researchers interested in sector rotation. Based on the literature review, the author of the article proposes hypothesis that sector rotation of big foreign investors in developed markets can influence financial assets in emerging markets because of inter-market correlations. And hence this influences business cycles of emerging economies. There are no doubts about cyclical development of economics, so that is why the economic cycles’ theory (Stovall, 1996) has found the way to be applied in investment strategy, which is called sector rotation. The investment strategy based on the sector rotation has foundation on the fact that in different business cycle phases different sectors are developing in different ways. Therefore, if the portfolio manager determines the correct phase of business cycle, then he/she can identify the sectors that will outperform the market (stock market index) and sectors that will lag behind the market. 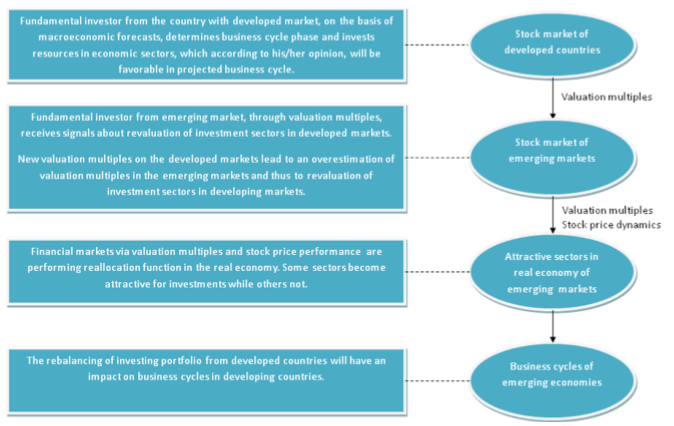 The aim of this article is to establish a theoretical framework for investment strategy based on sector rotation and propose a hypothesis that sector rotation by big foreign investors in developed markets can influence business cycles of emerging markets. Literature review In the Western countries, there are many studies and papers related to the issue of sector rotation. Below it might be found review of the key researches related to the topic mentioned above. Pring (1992) writes in his book that at different stages of the business cycle, different classes of assets behave differently. He divides three classes of assets: bonds, stocks and commodities. Talking about stocks, Pring (1992) notes that during economic growth is better to invest in the metal, mining and technology companies and, on the contrary, to reduce investments in the financial sector or in the sector that provide public services. However, Pring (1992) has not studied the behaviour of different sectors deeply, the most complete and one of the deepest research is performed by Stovall (1996). In 1996 Stovall, leading investment strategist at Standard and Poor’s, has published a book “Standard & Poor’s Sector Investing”, in which he explored how different economical sectors behave in the stock market depending on the phase of business cycle. The research was based on statistics of National Bureau of Economic Research (NBER), USA. NBER (n. d.) defines business cycles according to the peak and trough. Where recession is the period between peak and trough and expansion is the period between trough and peak. 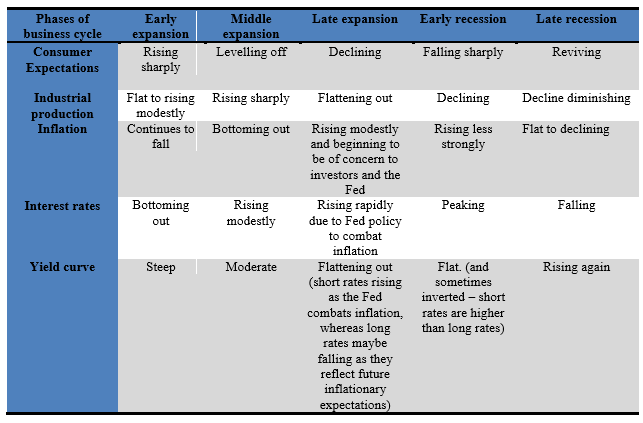 In his work, Stovall (1996) divides the recovery period of 3 phases: early expansion, middle expansion and late expansion. The recession period he divides into two phases: early recession and late recession. Table 1 shows Stovall (1996) approach to business cycles. He identified five factors that can help to determine what stage of business cycle is the economy at the moment. These factors include: expectation of consumers, industrial production, inflation, interest rates and the curve of USA government bonds. 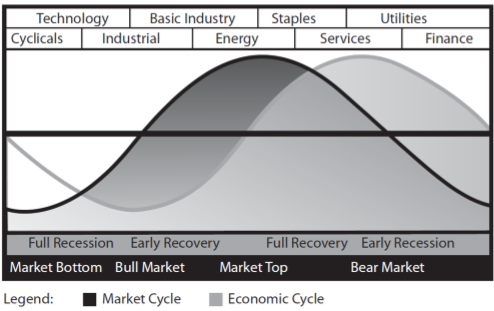 The results of Stovall (1996) study shows that at a certain phase of the business cycle, there are sectors in which investment is preferable and could generate returns above the average of the market. Table 2 shows Stovall (1996) study results. Empirical researches, conducted by Estrella and Mishkin (1998), as well as by Chauvet (1999) confirm the relationship between business cycles and stock market. Estrella and Mishkin (1998) in their research explored how to use the financial assets and their prices for the prediction of future recession of U.S. economy. The authors of the research have identified the spread of the yield curve of government bonds and the stock market indexes as very useful tools, which together represent a very reliable and simple model to predict the state of the economy. Chauvet (1999) research shows that there is a correlation between fluctuations in the stock market and business cycles. Murphy (2004), in contrast to Stovall (1996), in his book divides business cycle into 4 phases: full recession, early recovery, full recovery, early recession, and identifies four factors that can help to determine at what stage is the economy at the moment. These factors include consumer expectations, industrial production, interest rates and yield curve. Unlike Stovall (1996), Murphy (2004) removes such factors as inflation in order to determine the phase of the business cycle. Table 3 shows the data about above mentioned factors’ behaviour depending on the phase of the business cycle. 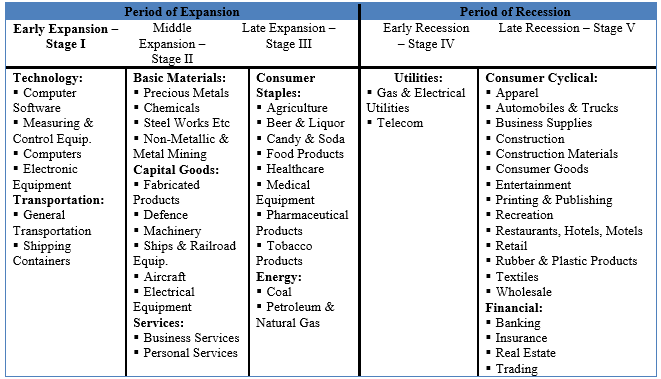 Figure 1 represents the model of sector rotation according to the phase of the business cycle. Despite the differences in Stovall (1996) and Murphy (2004) approaches related to business cycle phases and used factors for business cycle phase determination, there is an agreement about the sequence and priority of sectors. It is necessary to emphasize, that in empirical studies Stangl et al. (2009) suggest that sector rotation truly is able to bring returns higher than a passive investment strategy of “buy and hold”. Quite interesting seems the research by Conover et al. (2008). In their research they focused on the monetary policy of the Federal Reserve and applied the classification of sectors as cyclical and non-cyclical. Conover et al. (2008) performed a study of sector rotation strategy, where they used signals of U.S. monetary authorities for the sector rotation in portfolio. They used U.S. stock market statistics for the period of 33 years and have got very interesting results. In studies Conover et al. (2008) came to a conclusion, that the changes in U.S. Federal Reserve monetary politics are leading indicator for the sector rotation in portfolio. Empirical studies show that soft monetary policy favours stock of cyclical sectors, and tight monetary policy leads to better results of stock of non-cyclical sectors. The investment strategy based on sector rotation with usage of signals from the U.S. monetary authorities shows a 3.4% higher yield than the market average. In this case the standard deviation of this portfolio is lower than the standard deviation of the market. In the studies Conover et al. (2008) in contrast to Stovall (1996) divide 10 economy sectors to 2 groups: cyclical and noncyclical (see Table 4). Bernanke and Kuttner (2004) investigated the effect of monetary policy on stock returns. The results showed to such sectors as energy and utility that changes in monetary policy have little effect to. Quite sensitive appeared to be high-tech sector and telecommunications. This also confirms that there is relationship between cyclic recurrence of sectors and monetary policy (Conover et al., 2008). Stangl et al. (2009) have tested the theory of sector rotation for the period from 1948 to 2007. As an assumption, they modelled the situation, where investor ideally predicts all phases of the business cycle. Regarding to the choice of sector, they relied on Stovall (1996) approach. The results showed that on average, this strategy is superior to the market by 2.3% per year. However, added transaction costs, using the superiority of a strategy based on the sector rotation, would be even less and would be 1.9% per year. As empirical researches show, the sector rotation strategy is able to generate returns above the market average. These findings give reasons to believe that investors, who use fundamental approach, can be using the investment strategy that is based on the sector rotation. The positive correlation between stock markets between countries allows to make an assumption that the actions of the fundamental investors in developed markets will be the signal for fundamental investors in emerging markets. Signals will be sent through the valuation multiples. The received signals by fundamental investors from emerging markets will be broadcasted as a reassessment of economic sectors in emerging markets. In this way, the growth of sectors in developed markets will contribute to the growth of similar sectors in emerging markets and vice versa, the fall of sectors in developed markets will contribute to the fall of the same sectors in emerging markets. I guess we will not see 100% positive correlation within the daily price fluctuations. However, in long term period the dynamics of different economy sectors will determine the dynamics of similar sectors of developing economies. So the investment decisions of large investors from developed markets, who profess the fundamental approach in the choice of sectors of the economy as an object of investment, have a positive impact on investment attractiveness of the sectors in emerging markets. Graphically it could look like as it is represented in Figure 2. Due to the fact that one of financial markets’ functions is the efficient reallocation of funds from one sector to another or, in other words, through the prices of assets in stock market, some sectors become attractive for investments while others not. Consequently, the real investments with priority will go to those sectors that are attractive in the stock market. In this way, the rebalancing of investing portfolio from developed countries will have an impact on business cycles in developing countries. This means that if there is an assumption that business cycles originally do not coincide and were developed independently, so the opening of financial markets by developing countries has led to interference into autonomous development of the business cycle of these countries. Literature review of sector rotation suggests that this is interesting investment strategy for investors who use “top down” approach. As for the Russian market, in my opinion, the empirical testing of this approach on the Russian stock market may be of interest to Russian investment managers. Due to the fact that there is a correlation between the developed and emerging markets, I have made a hypothesis that sector rotation in the portfolios of the major foreign investors may influence the value of financial assets in emerging markets and thus affect the business cycles of developing economies. My further study will focus on empirical testing of the hypothesis mentioned above. Bernanke B.S., Kuttner K.N. (2004) What explains the stock market’s reaction to Federal Reserve policy? Finance and Economics Discussion Series, 2004-16, Board of Governors of the Federal Reserve System (U.S.). Conover C.M., Jensen G.R., Johnson R.R., Mercer J. M. (2008) Sector Rotation and Monetary Conditions. The Journal of Investing, Spring, Vol. 17, No. 1, pp. 34-46. Estrella A., Mishkin F.S. (1998) Predicting U.S. Recessions: Financial Variables as Leading Indicators. The Revier of Economic and Statistics, Vol. 80, No. 1, pp. 45-61. Murphy J.J. (2004) Intermarket Analysis. Profiting From Global Market Relationships. John Wiley & Sons, Inc.
Pring M.J. (1992) The All-Season Investor: Successful Strategies for Every Stage in the Business Cycle. John Wiley & Sons, Inc.
Stangl J., Jacobsen B., Visaltanachoti N. (2009) Sector Rotation over Business Cycles. Massey University – Department of Finance and Economics. This draft: August 2009. Available at: http://69.175.2.130/~finman/Reno/Papers/Sector_Rotation_across_Business_Cycles_FMA_2009.pdf 9. Stovall S. (1996). Standard & Poor’s Guide to Sector Investing. McGraw-Hill.